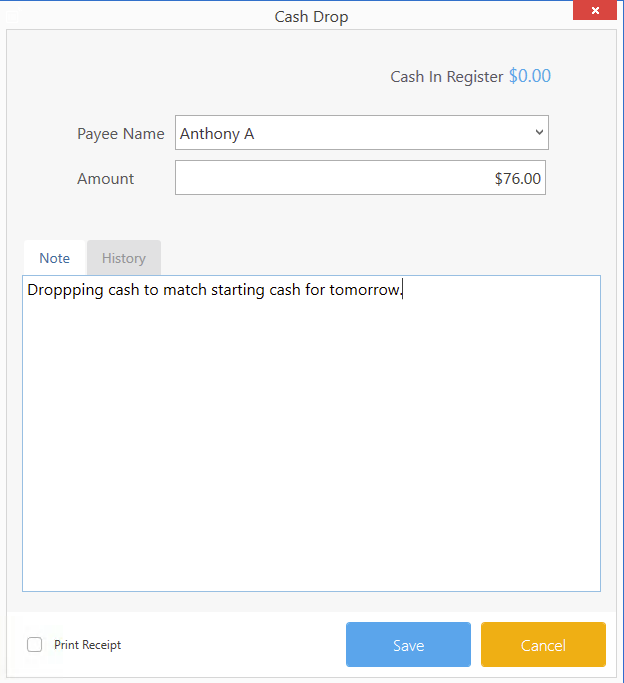 From the List of Add Cash you can view, print, delete and edit your cash drops. You can also create a new Cash drop through the List tab by clicking on the Red Plus icon. Then, click on the Add Cash icon. Select the cash drop from the list. Click on the Eye icon from the options above to view the cash drop. Then, click on the Cash Drops icon. Select the Cash drops from the list. Click on the print icon to print the cash drop. Click OK to to delete the cash drop. The cash drop will be deleted and the cash will be removed from the register. Notes: Enter any notes regarding the cash drop. These notes will not be printed and are only visible to users. Payee History: Check the history of cash drops for a payee by selecting your payee and clicking on the History button.